It's been four years since writer/director David Robert Mitchell unleashed It Follows (review) on us and now he's back with another oddity: Under the Silver Lake. Rather than curses, this time around Mitchell focuses his sharp wit on hidden messages with Andrew Garfield starring as Sam, a handsome oddball who falls for a girl who seems to like him too. When she suddenly disappears, he becomes obsessed with the notion that she's left him a secret message and that he must uncover it to find her. Oh yeah, and he also starts to think that there are factions in the world that are sending hidden messages all the time and that we're all just too dumb or distracted to notice. Along with Garfield, the movie also stars Riley Keough, Sydney Sweeney and Topher Grace. This looks just batshit enough to work and you just know that with A24 distributing, this will likely be a winner; their track record is stellar. And really, It Follows won Mitchell enough rope for at least one major flop before writing him off. Thankfully this one doesn't look like it'll be the one. 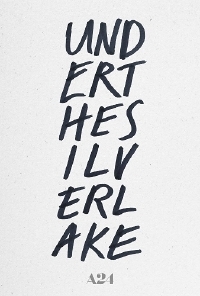 Under the Silver Lake opens June 22. Wow, that looks like a great film. And LOVE the band.